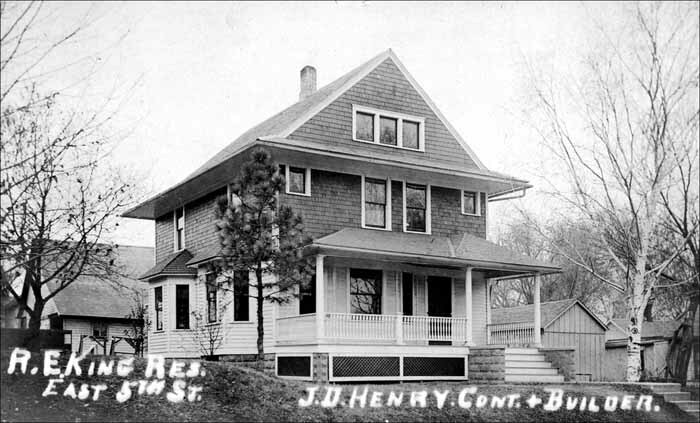 The R. E. King house on East 5th Street was built by J. D. Henry. This photo postcard was never mailed, but was enclosed with a letter to Uncle Charley Petty, who lived in Brewster, Kansas and was the uncle of Judson Henry's wife. It reads: "Dear Uncle Charley, Will send you some pictures of the work Da [Da was Judson Henry's nickname] has done this summer. He can make so much more contracting. We are going to try it another year here. The prospects are so good. I hope you are still prospering. I think you might write some time. Edith." The 1920 Federal Census shows Rollin E. King and family living at 311 E. 5th Street in Atlantic, Iowa. Other census records also show a Ralph E. King, son of Rollin, living at various addresses in Atlantic, but presumably the above photo is of the Rollin E. King residence at 311 E. 5th.